If you’ve ever written any piece of writing, you know that mistakes are inevitable. They happen to the best of us: from pesky typos to not finding quite the right word to so many grammatical nuances it’s hard to keep track. Of course, having an editor or a writing teacher always on hand to correct all those mistakes would be ideal. (I’m an editor myself, so I’m a little biased, but it’s true.) There’s no replacing the knowledge and experience of a real, live human who understands how language works and who can help you communicate your ideas in the best way possible. 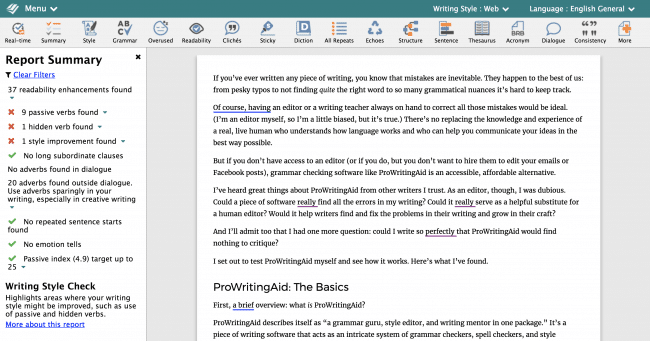 But if you don’t have access to an editor (or if you do, but you don’t want to hire them to edit your emails or Facebook posts), grammar checking software like ProWritingAid is an accessible, affordable alternative. I’ve heard great things about ProWritingAid from other writers I trust. As an editor, though, I was dubious. Could a piece of software really find all the errors in my writing? Could it really serve as a helpful substitute for a human editor? Would it help writers find and fix the problems in their writing and grow in their craft? And I’ll admit too that I had one more question: could I write so perfectly that ProWritingAid would find nothing to critique? I set out to test ProWritingAid myself and see how it works. Before we get started, I wasn’t paid to write this review, but I do want to be fully transparent and let you know that the links in this article are affiliate links. If you sign up for ProWritingAid, it will help me be able to keep writing and sharing editing advice. Of course, this won’t affect your overall price, and it didn’t affect my decision on the program — like I said, I’m starting from a place of skepticism. Take a look at ProWritingAid here. How does it stack up? Here’s what I’ve found. 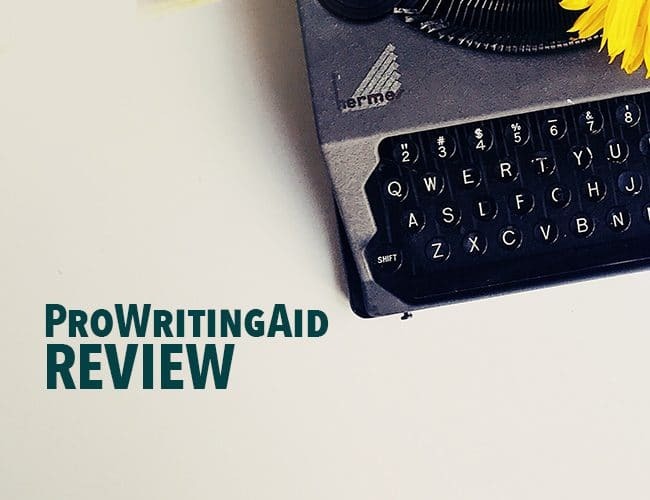 First, a brief overview: what is ProWritingAid? 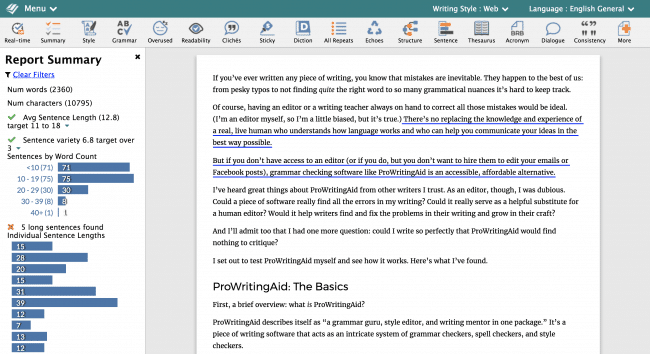 ProWritingAid describes itself as “a grammar guru, style editor, and writing mentor in one package.” It’s a piece of writing software that acts as an intricate system of grammar checkers, spell checkers, and style checkers. ProWritingAid is designed for writers, editors, copywriters, students, and other professionals. Whether you’re new to writing or a seasoned author, it has features that will give your writing a boost at every level. It’s available in both a free version and a paid premium version. Of course, in the premium version, you’ll get significantly more options and support. What features does it include? Let’s take a look. This is the cornerstone of any writing aid software, and ProWritingAid delivers. It has robust grammar and spelling checkers, more thorough than even Microsoft Word. Errors are underlined in red for spelling and blue for grammar. My favorite feature here is that when you mouse over the underlined text, a little box pops up with not only a suggested correction but also an explanation of why it suggests this correction at all. Plus, there’s a real-time error checker that will count up all the issues it finds and point you to them with a single click. Don’t want to see how many issues it spots as you write? Turn it on or off at any time. ProWritingAid isn’t just an error fixer. It’s a teaching tool: pay attention to the issues it notes, and you’ll become a better writer. As an editor, one of the first questions I ask of any piece of writing is, who is this writing for? Who is the audience? And with that in mind, what’s the best approach for this piece? A Facebook post, for instance, is casual and informal. A legal document, on the other hand, is very formal. Blog posts, novels, memos, emails, and essays all fall on a spectrum in between. Whether you’re writing a business report or a tweet, ProWritingAid will customize its suggestions for you. Most writing tools come with a built-in dictionary and thesaurus. ProWritingAid takes it a step farther with a dictionary, a thesaurus, and a wide variety of word suggestion tools. Looking for the perfect word for your English paper? Try the standard dictionary and thesaurus. Mouse over any underlined word and it will offer a list of alternate suggestions. Writing poetry and need a lyrical line—or want to avoid overusing alliteration in a serious document? There’s an alliteration analysis for that. Drafting a brilliant new story and want to make sure you haven’t relied on a slew of clichés? The cliché and redundancy report will catch them all. Not sure if you’ve used the right there, their, or they’re? The homonym check will evaluate your word usage and correct any misplaced words. With all these tools, you’ll be sure to use the right word at the right time all the time. So far, so good. To this point, I’ll admit I was feeling pretty confident in my ability as an editor to best ProWritingAid. But here, it provided analysis that even I, for all my love of grammar, couldn’t gather without ProWritingAid’s help. I mentioned several of ProWritingAid’s dictionaries, reports, and checkers above. Those barely scratch the surface of the tools ProWritingAid offers. There are more than twenty reports you can use to analyze your writing in a variety of ways. I won’t cover them all, but I want to highlight a few of my favorites. At a glance, it will show you exactly where you can make small tweaks to your writing that can improve the style and create a better experience for your readers. Many writing tools include word counters, but the Sentence Length report is so much more powerful than that. It will count the number of words and characters in your document, yes. But it will also count every word in every sentence and display them in an illuminating visual. You’ll see your average sentence length and how much your sentence length varies, and it will warn you of any particularly long sentences. When you know what you mean to say, it can be hard to tell where readers won’t understand. The Sentence Length report is a helpful way to catch lines that might be confusing so you can break them apart. 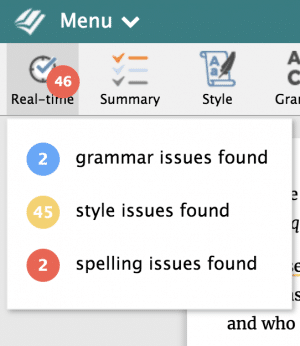 ProWritingAid includes not one, but three reports to help you catch any repetitive words. The Overused Words report will mark any overused words, ones used so many times that they’ll definitely make readers pause. Plus, it will tell you how many instances to remove so they aren’t overused anymore. It will even compare your use with other published writing so you can see how your style stacks up against other similar works. The All Repeats report will mark words and phrases up to four words long that you’ve used repeatedly throughout your text. They aren’t necessarily overused, but it’s helpful to be aware of anything you tend to repeat. The Echoes report will mark any words or phrases that are repeated in close proximity to one another. It will also suggest alternative words you can use to break up the repetition. The Sentence Structure report is one I personally find fascinating. It reviews all the ways you structure your sentences so you can see where you’re repeating certain syntax. For instance, 37% of my sentences start with a subject, but none start with a gerund. That’s neither right nor wrong, but it gives me helpful direction for how to increase the variety in my writing. This is the kind of report I wasn’t expecting, but was so excited to find. The Pacing report is an amazing tool for creative writers. Some backstory is good; too much, and you’ll start to bore your reader. This tool will identify any sections of your manuscript that slow the pace so you can see at a glance whether it’s too much or just right. Plagiarism is a huge concern for writers, and the Plagiarism report will help put your mind to rest. ProWritingAid has scanned millions of articles, books, and academic papers, and it will analyze your writing for any lines that appear in other documents. Unlike other ProWritingAid reports, the Plagiarism checker isn’t included in the typical Premium package. You can upgrade to Premium Plus for fifty plagiarism checks per year, or you can purchase checks to use as you need. Do you write for an organization that has a house stylebook? Do you want ProWritingAid to check for specific rules or patterns in your writing? The House report is a blank report you can customize to be completely yours. Tell ProWritingAid what you want it to analyze, and it will produce a report. I’ve mentioned nine of ProWritingAid’s reports above, but that’s not even half of what this tool can do. I encourage you to take a look at the full list here, or even sign up for a free trial so you can play around with it yourself. With these reports, you can get as granular as you like in your writing analysis. Take a deep dive into readability with the Readability report, nitpick every inconsistent detail with the Consistency report, or simply correct grammar errors and move on with the Grammar report. No matter what kind of writing you’re working on, there’s a report that will help you refine your piece and become a better writer. You can use the ProWritingAid editor directly on the ProWritingAid website. 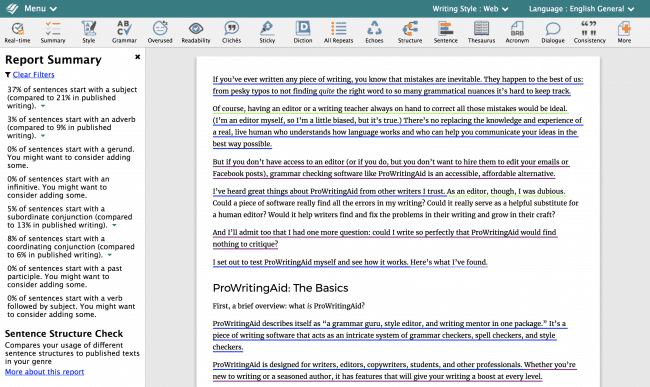 Draft your writing there in the editing tool, or copy and paste it in from another document. But you’re not locked in to the ProWritingAid website. 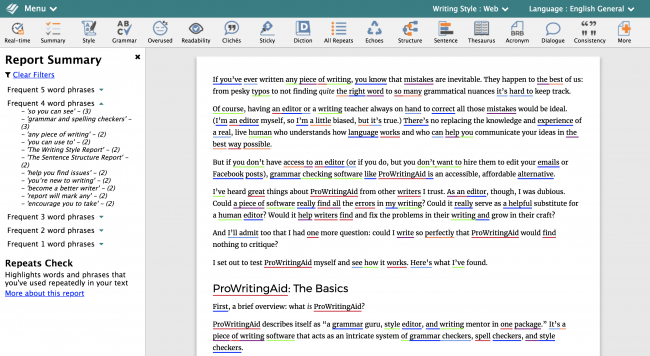 Whether you write in Microsoft Word, Google Docs, or Scrivener, you can download a plugin to bring ProWritingAid’s writing analysis to your preferred word processor. Plus, download the Chrome extension, and your personal writing checker will follow you around the internet. No need to worry about typos in your Facebook statuses again! So what’s in the box? What do you get when you sign up for ProWritingAid? Here’s the breakdown of the free versus premium versions. Ready to try it? Sign up for ProWritingAid here. The free version of ProWritingAid is a great place to start. Personally, I enjoy the flexibility and increased capacity that comes with the premium version. What does it cost to go premium? ProWritingAid operates on a subscription model. You can choose how many years you’d like to join, or go all in with lifetime access. ProWritingAid also offers a fourteen-day refund policy. If you try it out and decide it won’t help you with your writing, you can cancel your subscription within two weeks and you’ll receive a full refund. ProWritingAid offers just one refund to every customer, so if you sign up a second time, make sure you’re sure! I’ll add one caveat here that I think is important to mention in any discussion of grammar checkers and writing tools. Grammar checkers are meant to help you find issues in your writing and offer possible solutions. ProWritingAid is remarkably good at understanding context and usage and suggesting the correct solutions. That said, like any grammar checker, it’s still important that when you use it, you consider each suggestion carefully and feel free to reject any that aren’t helpful. No matter what grammar checker you choose, if you blanket accept every change it suggests, you will introduce new errors into your writing. In that sense, grammar checkers will never fully replace a good editor. But they’ll get you a lot closer to a perfectly edited piece of writing. And ProWritingAid’s features go so far beyond grammar checking, I believe it’s a useful tool for any writer. The Verdict: Would This Editor Recommend ProWritingAid? I’ll be honest, I came in a skeptic. I believe strongly in the value of a good editor. Even with all the reports ProWritingAid offers, I don’t think there will ever be a full replacement for the human element. That said, I was blown away by all the features included in ProWritingAid. Here’s my honest ProWritingAid review: I think this is an incredibly helpful tool for writers at every level. Ready to give ProWritingAid a try yourself and see how it improves your writing? If you’re new to writing, not sure how to find all your grammar errors, or want to practice your English language skills, ProWritingAid’s grammar and spelling checkers will help you find issues, correct them, and learn how to avoid them in the future. If you’re looking to refine your writing style or vary your vocabulary, ProWritingAid’s robust style and word choice tools will help you take your writing to the next level. And if you’re like me and believe you’ve advanced far beyond what a mere writing tool could teach you, I’d encourage you to take another look. I love seeing the granular breakdown of my writing sentence-by-sentence and word-by-word. ProWritingAid identifies patterns I didn’t recognize in my own writing so I can understand my personal style better and adjust as I like. Will ProWritingAid help you improve your writing? This editor says yes. Whether you want an automatic tool to find and correct grammar and spelling, a teaching device to help you master grammar rules, or a style checker to help you refine your prose in more than a dozen different ways, ProWritingAid will give you the feedback you need. Do you use ProWritingAid? Do you have any favorite features I’ve missed? Let us know in the comments. She wanted water, but it was just out of reach. Can you start every sentence with a subject? Write for fifteen minutes. When you’re done, share your writing in the comments section, and be sure to leave feedback for your fellow writers. Don’t forget to check out ProWritingAid, too!